Unified communication and collaboration (UCC) tools are designed to enable seamless real-time communications and collaboration anytime, anywhere and on any device. 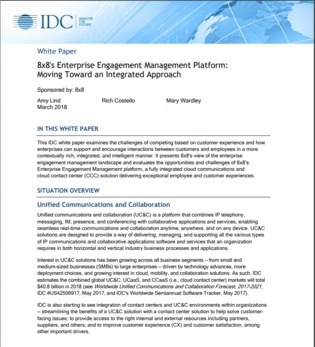 This IDC white paper explores how UCC tools can support customer experience initiatives and increase satisfaction. Plus, learn about 8x8’s Enterprise Engagement Management platform, a fully integrated cloud communications and cloud contact center tool.